I have some very exciting news to share with you . . . a new development that has the potential to save countless more precious lives through Operation Baby Rescue. After listening to the feedback of numerous Operation Baby Rescue advocates, the number one need mentioned was for a user-friendly guide for sharing this incredible cause with others—a way to compliment the gripping documentary that has already moved so many to action. 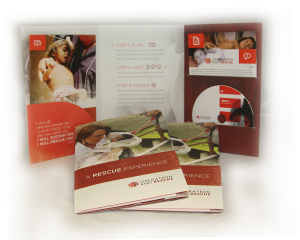 To meet this need, we have just released the official Rescue Experience Kit, an invaluable resource that contains everything you need to know about hosting your own rescue event for this incredible cause. An Operation Baby Rescue DVD containing the full-length documentary (English and Spanish versions), a PowerPoint to accompany your presentation, visual aids, posters, handouts, and more! The Rescue Experience is an excellent resource for sharing the desperate realities so many children face on a daily basis, and most important, the opportunity we have to make a difference in their lives! You can order yours free today by going to worldhelp.net/rescue/kit. It’s simple, straightforward, and will only take a few minutes of your time. Hosting your own screening event—big or small—is such a powerful platform for getting others involved and brings us even closer to our goal for 2012: to raise $1.2 million . . . enough to rescue 1,000 precious children! Having just returned from visiting children in our Guatemala rescue program, I can tell you this—your gifts are transforming lives every single day. Children who were on the brink of death are now thriving—smiling because they have experienced hope for the very first time. That’s why the rescue is so important . . . it makes hope possible, alive, and real. And the hope that comes from getting a second chance is possibly the most powerful of all. Take the first step by ordering your free Rescue Experience kit today. There’s no better time to begin saving lives!